Cheers erupt, poms rustle and the band plays “Varsity Valor” again, but this is not a typical KHS football game. Choosing between band, poms/cheer and flag football, KSD students with special needs will be invited to participate in this year’s “Wednesday Night Lights.” KHS will hold its second annual inclusive version of a high school football game, where students with and without disabilities will play together and experience the game Sept. 20 at 6 p.m. at E.L. Lyons Memorial Stadium. 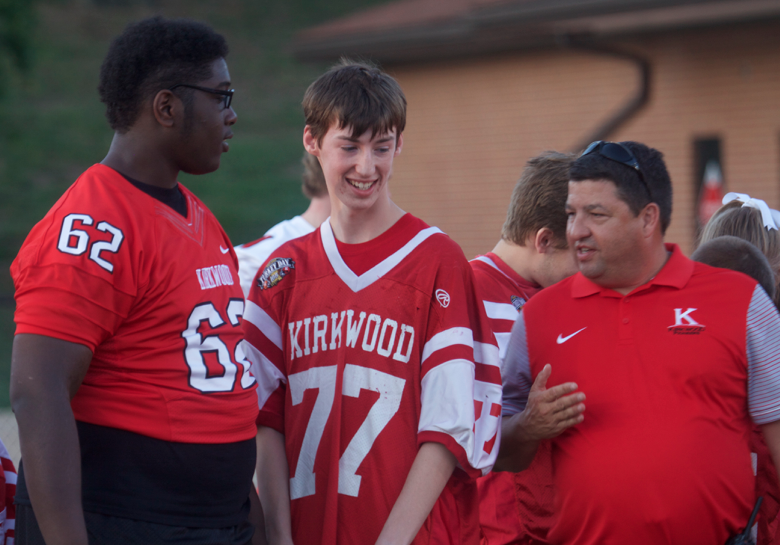 After leading a similar event in Eureka, Shelton wanted to take the event to Kirkwood, bringing it to life last year. Students in KSD with special needs as well as their siblings are eligible to participate and can sign up online. KHS students involved in football, poms, cheer and band are given a buddy during the game while SSD teachers also help out. Admission to the game is free; however, donations are encouraged and can be made at the event or online at pioneerathetics.org, benefiting KSD’s Special Education program. In contrast from last year, students from Kirkwood Early Childhood Center are now also invited to take part in the game. After eating pizza together, each participant will storm the field and will be announced individually. Then flag football games will take place divided by age groups while poms/cheer and band pump up the crowd.